Across millions of acres of public lands, nearly 600 law enforcement personnel are deployed to police in the trees, protecting people and natural resources within the jurisdiction of the U.S. Forest Service. That number includes 441 law enforcement officers, 83 criminal investigators and 72 administrative and support staff members. But according to a government watchdog that tracks threats against federal employees, it’s not enough. In fact, Public Employees for Environmental Responsibility, or PEER, says it’s a record low, even as employees face more attacks. “Assaults on and threats against U.S. Forest Service employees increased by nearly a third in the past year,” according to PEER, which represents local, state and federal scientists, law enforcement officers, land managers and other resource professionals. Natural resources and wildlife are also at risk, according to Jeff Ruch, the group’s director. 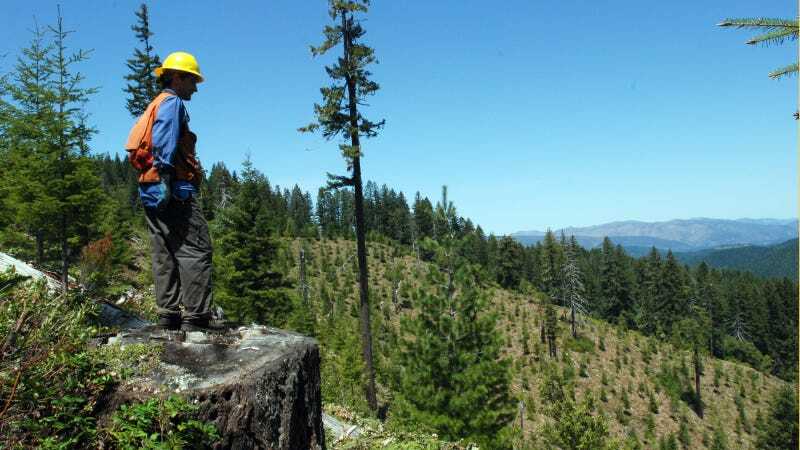 The Forest Service isn’t capable of preventing or detecting timber theft, for example, because the agency is systematically understaffed, Ruch said. Law enforcement officers on these federal lands have been going down even as the amount of federal land is going up. The Forest Service admits that staffing levels are “very low,” but Babete Anderson, a spokeswoman for the agency, said she didn’t know if they’re at a record low right now. Thanks to hotter, drier and longer fire seasons, she said, the agency has had to make “a number of tough choices about the agency’s budget.” Over the last decade, the agency reduced the number of full-time employees in programs unrelated to wildfire by about 35% while fire suppression efforts have grown to gobble up more than half of the Forest Service’s budget, according to Anderson. “We recognize the impacts that budget cuts are having on the law enforcement community, but it’s important to understand that the agency has had to make reductions across the board in order to meet the increased challenges of funding wildfire suppression,” she said. Since 1983, the National Interagency Fire Center has documented an average of 72,000 wildfires each year, according to EPA, and the area burned annually appears to have increased since the 1980s. Of the 10 fires that scorched the most acreage, for example, nine have burned since 2000—a period that coincides with some of the warmest years on record, according to the agency. In a study published in the fall in the journal PNAS researchers at Columbia University concluded that human-induced climate change has doubled the area affected by forest fires in the American West in the past 30 years. Further global warming is expected to increase wildfires exponentially in the coming decades. In 2015, the U.S. Department of Agriculture, the Department of the Interior and the Office of Management and Budget urged Congress to change how the country pays for wildfire costs so that the federal government could continue to invest in restoration at the same time. “With the dramatic growth in wildland fire over the last three decades and an expected doubling again by mid-century, it only makes sense that Congress begin treating catastrophic wildfire as the natural disaster it is,” wrote Interior Secretary Sally Jewell, Agriculture Secretary Thomas Vilsack and Shaun Donovan, director of the management and budget office. But legislation backed by then-President Barack Obama to allow adjustments to discretionary spending caps to fund firefighting died in committee as lawmakers disagreed on the best funding. The budget proposed by President Donald Trump actually allocates $2.7 million more to law enforcement operations while cutting funds for most other programs, such as collaborative forest landscape restoration (-$39.9 million); land management planning, assessment and monitoring (-$19.6 million); and wildlife and fisheries habitat management (-$15.2 million), according to the budget justification report from USDA for fiscal year 2018. However, that money won’t be funneled to pay for more officers. The budget includes appropriations for 691 full-time employees, same as in fiscal years 2016 and 2017. The Forest Service hasn’t used that funding to hire additional personnel this year because of “extensive specialized training requirements” and insufficient “training capacity” to plug vacant positions, according to Anderson. However, she said, the Law Enforcement and Investigations program is currently hiring new personnel and expects to have about 668 employees on board in late fiscal year 2018, which starts on Oct. 1, 2017, and ends on Sept. 30, 2018. That will bring the agency closer to average yearly staffing levels for the law enforcement program—about 688 annually since 1995. The number of documented law enforcement incidents increased from 5.3 per 10,000 forest visits in fiscal year 2016 to 6 per 10,000 in 2017, according to USDA. The percent of cases referred for adjudication also grew, from 4.5% to 7.2%. Among the violence, threats and intimidation that PEER has documented against Forest Service employees in 2016: sexual assault, disorderly conduct, and threatening a campground host. But Anderson suggested that the spike has resulted from growing increased awareness and vigilance among Forest Service employees. Artifact looting, commercial timber theft and illegal mining continue to be a problem for the Forest Service and natural resource agencies, Anderson added, but she wouldn’t describe such crimes as a “big problem.” Officers spend much of their time on recreational activities, she said, concerned with how people are using the federal land when they visit. Even so, campgrounds are where the Forest Service’s presence is most lacking, said Andy Stahl, executive director of Forest Service Employees for Environmental Ethics. A ranger might have given a naturalist talk around the campfire on a Friday night once upon a time, he said, but now an appearance by someone in the recognizable green uniform is rare. But with wildfires drawing down the agency’s resources, Stahl says, money for foresters, archaeologists, wildlife biologists and recreation specialists have been cut along with the cops. Rep. Lincoln Chaffetz has suggested that the federal government simply eliminate the police force in the Forest Service. A bill the Utah Republican introduced in January would task local law enforcement with patrolling federal land in lieu of the agency and the Bureau of Land Management. A spokeswoman for Chaffetz declined to discuss whether PEER’s findings lend credence to the legislation but pointed to a March 16 statement from the congressman about the proposal. Since then, of course, Chaffetz has announced that he’s resigning from Congress at the end of June. To Stahl, that means the bill is dead in the water and without the support of local sheriffs. “Talk about an unfunded mandate,” he said.